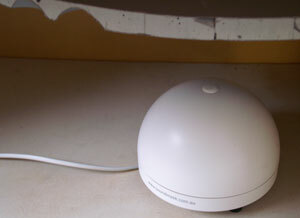 A unique feature of Soundmask's range is its under floor systems. Soundmask has developed and refined this specialist technology over many years to ensure the correct penetration and spread of sound. How does an Under Floor System work? 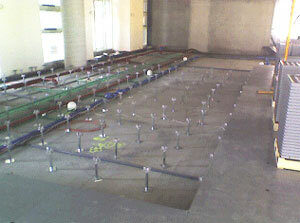 The under floor system is installed below a raised floor using Soundmask’s SM-T-2200 transducers. Like a traditional system, the generator and other system components connect to the transducers, which emit unobtrusive soundwaves to mask distracting noise and render speech unintelligible. Under floor systems are used where the heating, cooling and other services are installed beneath an access floor. What is unique about an Under Floor System? The increased demand for green or sustainable buildings has meant a world design movement towards LEED or "Green Star" certification. Where traditional heating and cooling systems use suspended ceilings, green buildings use innovative ventilation via perimeter and under floor systems. This concept often makes a suspended ceiling soundmasking system unusable, as all the services are via the under floor access. Further, the new heating and cooling technologies make the work areas very quiet compared with the traditional forced air systems, which creates noise problems requiring soundmasking. Access floors are generally manufactured from steel and concrete — often from recycled materials — with finishes like laminate, terrazzo, wood, cork, rubber and linoleum. This requires a powerful soundmasking system to penetrate the floor while ensuring the correct spread of sound. In our experience, Soundmask's under floor system is an excellent way to infuse a wash of sound to solve the problem of the quiet space while utilising the green technology of access flooring. The Council House 2 (“CH2”) building is said to be “The World’s Greenest Office Building”. The office environment was so quiet that it required the introduction of a Soundmask system — to impart a level of non-intrusive sound to the office environment. Because the air-conditioning and other services are all installed in the under floor system there are no suspended ceilings (where a traditional system would be placed). Therefore the transducers are located under the Tasman Access floor. This floor was manufactured from steel and concrete composite, requiring powerful transducers to ensure the correct penetration of sound. Soundmask's system introduced a non-intrusive background sound giving comfort and speech confidentiality, and reducing the intrusion of surrounding noise. The above picture shows a close up of Soundmask's SM-T-2200 with a cut out of the steel and concrete composite floor the sound needs to penetrate. 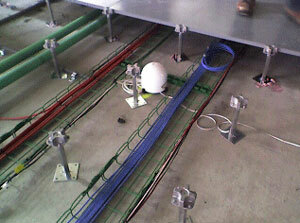 The pictures above and below show Soundmask's under floor transducers in place under the Tasman Access floor during the construction of the Council House 2 building in Melbourne.